Like many (or most) chemists in North America, the twice annual American Chemical Society (ACS) mega-meeting is an important calendar event in spring & autumn. Its primary value proposition is networking, but it also provides an important source of stretch goals. I’ll be presenting two talks, one on Monday about electronic lab notebooks, and the other on Tuesday, about cloud computing. I’m usually a bit of an overachiever when it comes to getting my presentations ready way ahead of time (or perhaps obsessive-compulsive is a better description), but lately I’ve been sliding through a bit closer to the deadlines. The math behind this equation is pretty simple: the more time I spend travelling and presenting at conferences, the less time I have to fill up my product pipeline. Consequently when I write up an abstract for a conference that’s happening 6-to-9 months from now, I know I’m going to have a whole lot of new things to talk about, but I still have to make an educated guess as to what and how much. Lately my stretch goals have been a bit more elastical, but I have been toiling feverishly to come up with the new content that I promised to talk about. 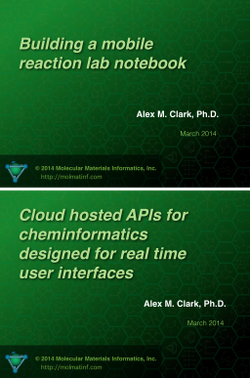 Presentation the first happens on Monday 17th March, and is about reaction lab notebooks. In particular, it’s about an app that I’ve been working on for quite some time, called the Green Lab Notebook. A few months ago I gave a presentation about this at the German Chemical Society meeting in Fulda (see slideshare), where I outlined many of the core concepts. Since then a large proportion of the app has actually been built (for some recent developments, see blog posts: here, this, that). The talk is shorter than usual (15 minutes plus questions), because electronic lab notebooks is one of the most active areas in cheminformatics right now, so there are lots of speakers. The central narrative of the talk involves describing the content creation process for a multistep reaction, done in a way that is digitally pure, meaning that the underlying representation is as easy for a computer to interpret, as the generated graphics are for a trained scientist to understand. Accomplishing this is not overwhelmingly difficult, but it is very unusual in contemporary software. These steps will be illustrated in the form of a mobile app that is functioning, albeit not yet available on the market. Once the fundamentals are established, the overlaying of green chemistry supporting features will be covered, in terms of what is working already, and what is coming up next. Presentation the second is on Tuesday 18th March, and is about cloud computing. This one is somewhat analogous to a presentation that I gave last year at the NETTAB meeting in Venice (see slideshare). That presentation described a workflow for using scaffold analysis to pursue new leads for tuberculosis targets, using mobile apps, desktop applications, cloud services, public databases, and a healthy dose of human scientist oversight. The upcoming ACS talk is based on the same premise, starting with data from the TB Mobile app, this time focusing on the inhA target (because this research might actually involve testing new compounds in an actual laboratory, and these assays are not all equally straightforward to setup). The workflow goes through a series of pipeline workflow steps. These are executed as scripts run on a desktop computer: the reason for this is quite simply because I ran out of time – they were originally supposed to be integrated into executable modules accessible from the new pipelining feature in the Mobile Molecular DataSheet (MMDS) app, which will intermediate between app+cloud, and would have been a perfect fit for the symposium theme. Luckily it is easy to pass data back and forth between heterogeneous environments, so the fact that that the new functionality is not yet mobile-accessible is not a dealbreaker for the narrative. The story goes on to describe the scaffold assignment process, looking up compounds in public databases, building models, and predicting good compounds to make. This part is quite similar to the subject material that I described at the New Orleans ACS meeting in 2013 (see slideshare), albeit with different content. Quasi-spoiler, but not really, I recently introduced some OpenPHACTS integration capabilities, and I have been experimenting ways to integrate it into the narrative of my talk, since it’s such a strong thematic match. While the functionality works well, I have not yet managed to figure out a way to make it a part of the story, and I already have enough slides. There’s still a week to go, so maybe I’ll think of something. I’m looking forward to spending a week with chemists in Dallas Texas, and I hope that plenty of y’all can make it to the CINF symposiae.